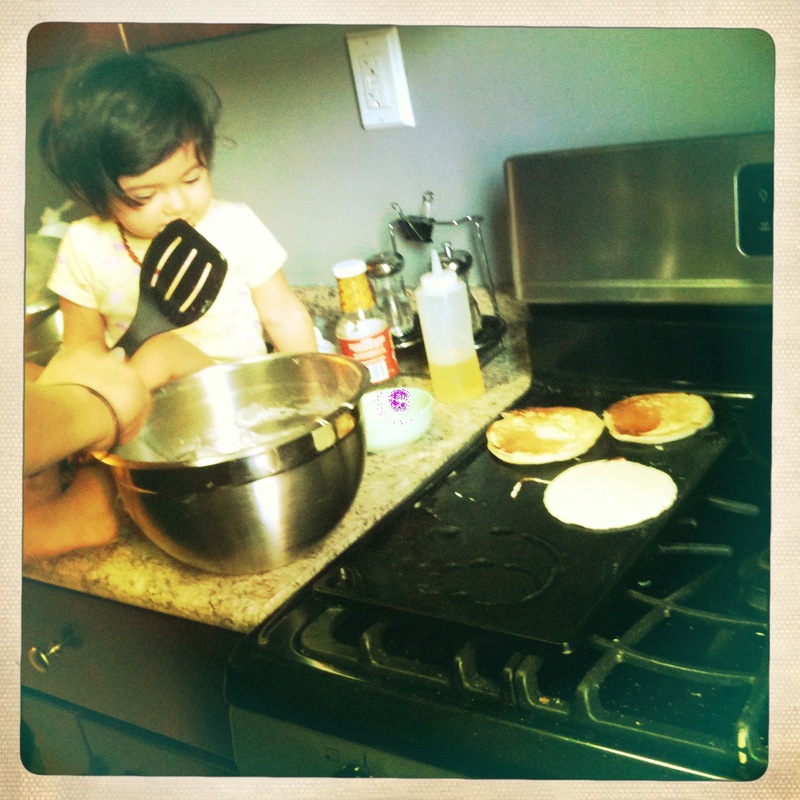 We love eating pancakes on the weekends and I happen to have the best pancake recipe ever. I don’t even remember where it came from but they always come out perfectly tender and cakey with a little bit of sweetness. My husband didn’t want me to share it because he wants to serve them in our restaurant someday but I was able to sway him with a little convincing. If you would like to amp up the nutrition factor you can cut the white flour with buckwheat flour. If I do it, I usually use 1/3 – 1/2 buckwheat flour and the rest All Purpose Flour. Buckwheat has little to no gluten. Gluten is the protein found in wheat flour that gives it it’s structure and strength. In something like a pasta or a bread, you want structure and strength, since chewiness and bite are attributes you aspire for. In pancakes you want them to be delicate, so you don’t want much gluten. With 100% buckwheat you end up with a batter with no structure and pancakes that are dense and need help from things like beaten egg whites to add lightness and stability. I prefer the flavor, texture and ease with less of a ratio of buckwheat flour but you may not. Experiment and see what works for you. This recipe calls for sour cream, which gives it richness and a little bit of tang. 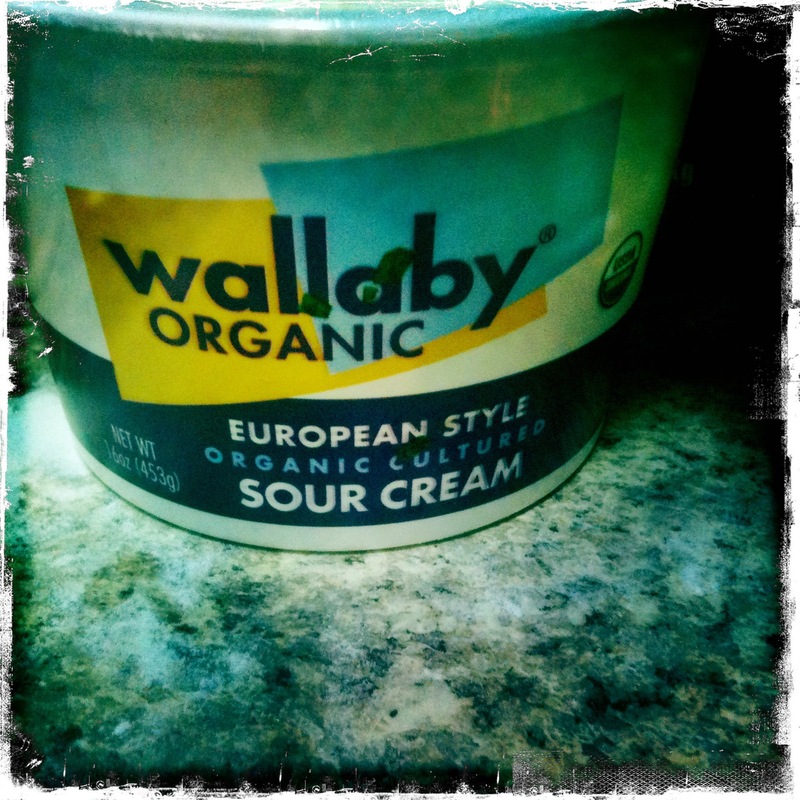 I am obsessed with Wallaby Organic sour cream lately because it’s thickness and flavor is heads and tails above the others I have tasted. It’s so good you could put it on berries, drizzle with a real Aceto Balsamico (Balsamic Vinegar from Modena) and dust with confectioners sugar to be eaten for dessert. Because the sour cream is so thick, I often need to add a splash more of milk to get the pancake batter to the right pouring consistency. We eat the pancakes with butter and real maple syrup. Did you know that there isn’t even any maple in products like Log Cabin and Aunt Jemima Syrup? They are primarily flavored with things like Fenugreek, a spice with a maple-like aroma, and then high fructose corn syrup, a cheap way to make it sweet. Besides being minimally processed and all natural, the real stuff just tastes so much better. Sifting the dry ingredients not only ensures that there are no foreign objects in the mix (something you have to worry about more in a commercial kitchen) but also aerates the flour to prevent the pancakes from being dense. You can sift by putting dry ingredients through a fine strainer and tapping the side with your hand, or stirring the flour with a wooden spoon to help it through. 1. Sift together dry ingredients except for salt because kosher salt won’t go through the sifter, the kernels are too large. 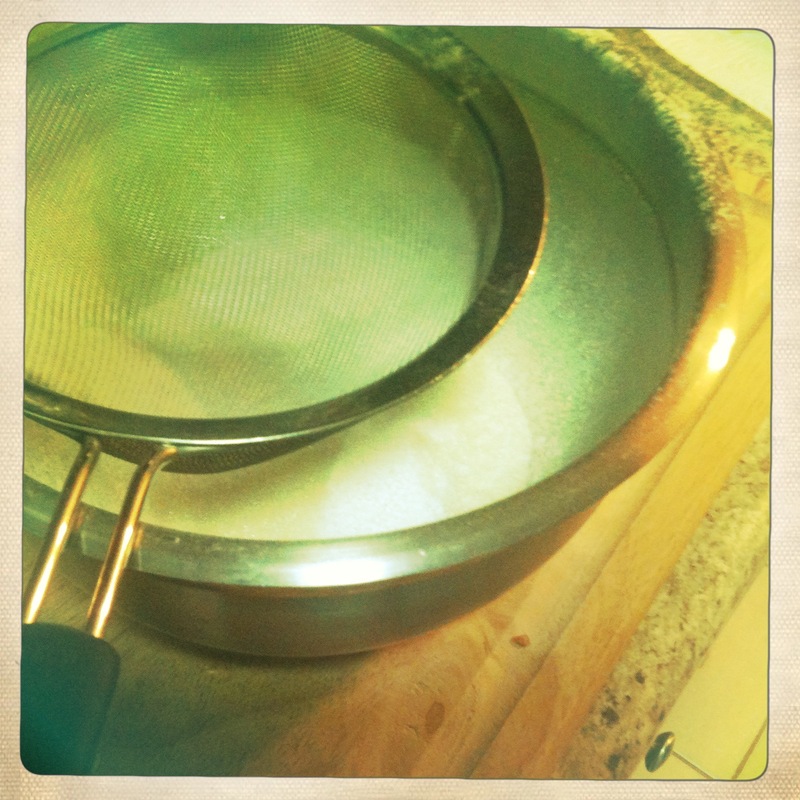 Add salt after sifting. 2. In a separate bowl whisk together remaining wet ingredients. Add wet to dry mixing only until combined. 3. Rest 30 minutes to relax the gluten. If you need to skip this step they will still come out fine. 4. Mix batter just to recombine. You may have to adjust consistency depending on the kind of sour cream you use. Batter should be thick, but able to pour off the spoon, not glop off. If needed to thin add milk, a few drops at a time. Heat griddle and place a pat of butter on. Swirl around to coat griddle with a thin layer. 5. 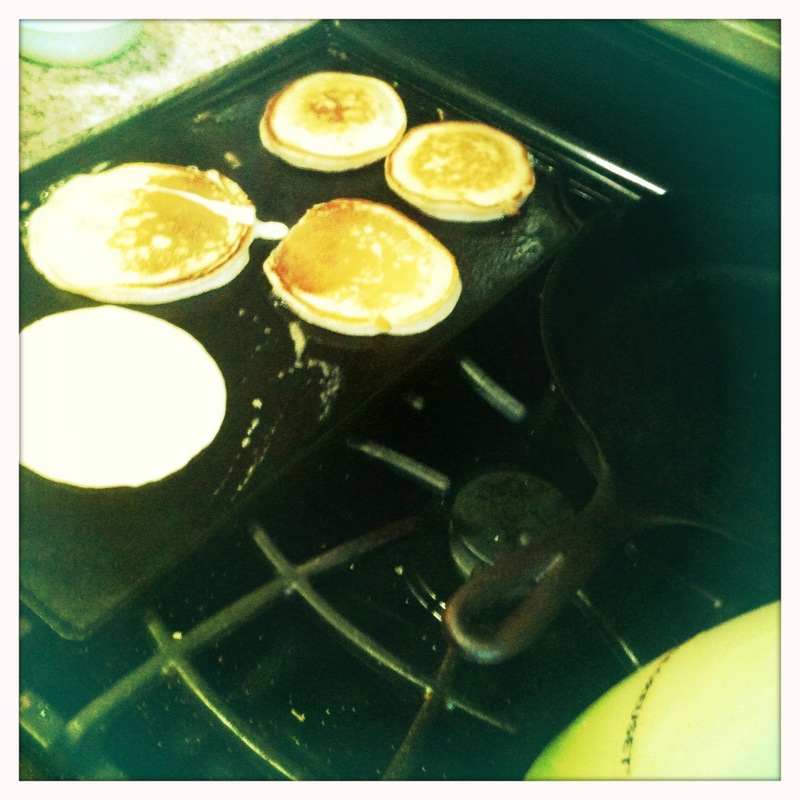 Test one pancake by gently dropping a small ladle full onto the griddle. Cook until lightly browned on one side and then flip with spatula. Cook other side. If you are happy with the consistency, cook the rest.